Everyman needs to buy a Tuxedo for those Black Tie Events and at these great prices you can't go wrong. This Tuxedo with Tails for men come with the white vest. Whether it's a fancy wedding that you're going to or maybe you just want to look off the hook at your prom when everyone else looks the same, a black tuxedo for men with tails can make you look your very best. 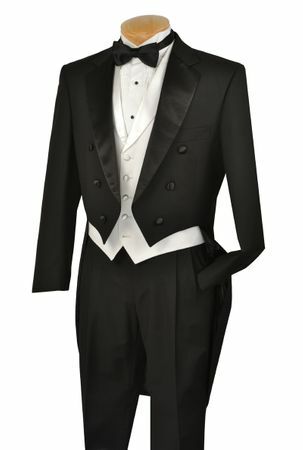 This Black Tuxedo with Tails made by Vinci features Luxurious Super 150s Wool Touch fabric with a white vest. Shopping online for your very own tuxedo is always a superior choice than renting one. Why would you want to rent when for literally a few dollars more you can buy your very own tuxedo for men. Finding a deal on your very own tuxedo for men is as easy as can be and you'll wonder how you never thought of buying your very own tuxedo sooner. Many men for some reason think that a tuxedo cost more than a suit but in reality they are the same price when you're comparing quality for quality. You can buy your very own tux and get a deal quick when you're in the Contempo Suit world. Shopping for deals on mens tuxedos shouldn't be an issue once you as the customer learn a thing or two on how to buy a tuxedo online. If you're a man who wears a suit every now and then or on a regular basis, you'll know that your tuxedo size is also the same size as your suit size. If you don't know your size. You just need someone with a cloth tape measure to measure your chest size for the jacket as well as your waist size. Once you figure the chest size and waist size, We strongly recommend going with your chest size because the jacket size of a tuxedo is the most important factor when figuring out what size to buy. The reason why we recommend the jacket size is because it cost far more to adjust or tailor the jacket to fit you properly compared to the pants which may or may not need to have the waist either taken in a couple inches or let out a couple inches. Another thing to consider of course when you want to buy a tuxedo is the style. Are you trying to keep it traditional or going for style points. At Contempo, you can buy either traditional style tuxedos like your basic black or white that come with regular lapels, peaked lapels or round shawl collar lapels. You can also buy a tuxedo with tails if you really want to make an impression for that black tie event. Now if you're style leans more to the wild side, look out because colorful tuxes are also in abundance at Contempo whether you're going for that red carpet look in the current fashion colors or even paisley and fancy pattern fabrics all designed for getting you noticed. So, when the time comes to buy a tuxedo, you'll have more than enough choices at Contempo.